There isn’t really any particular affection between them, but it’s starting to seem like Wardwell and Sabrina have a similar cause. Namely, neither of them wants Sabrina to end up as Satan’s prophet on earth. Poor Wardwell! A loyal servant for many years, about to watch an unqualified upstart get promoted above her. Who wouldn’t be upset? But this episode makes clear that Sabrina isn’t totally without her defenses. She’s clever enough to take the exact meaning she needs from Hilda’s story—namely, that it’s possible to play chicken with the Dark Lord, who is more invested in reassuring himself that his minions are in line than actually testing them. This episode featured an unusually present Satan. The episode begins with him chit chatting with Wardwell (note I wrote: “Satan just chilling in an armchair”), and then he visits Sabrina and others around her repeatedly in an effort to persuade her to commit increasingly evil acts. And the picture that’s painted of him in that effort is none-too-flattering. He’s simultaneously over-confident and insecure, positive that he knows Sabrina better than Wardwell even though Wardwell has spent more time with her, and vindictive when Sabrina won’t do his bidding. It doesn’t seem insignificant that Nick says that he and Lilith are “free of the false god’s petty tests” in the play Blackwood writes. Who’s doing petty tests now? Wardwell’s reaction to that play is intriguing. She gets quite emotional during it, but it’s hard to tell what she’s thinking. Does the play remind her of what she’s been promised, and what’s being taken away from her? Or does it remind her of her devotion to Lucifer Morningstar? Probably bathing his hairy feet later doesn’t do a whole lot to keep her in line, but Satan is just the kind of guy who’s going to gloat about his victory. Which we also learn isn’t a complete victory, in that Sabrina knew what she was doing. But the episode ends on a note of Schrödinger’s cat uncertainty. Did she steal the gum, or pay for it? Is she as able as she thinks she is to resist the darker parts of her power? The smirk suggests she’s a little more sinister than we’ve previously witnessed, but we don’t actually see her leave without paying. We’re left to infer the result from her reaction and the vacant cash register. 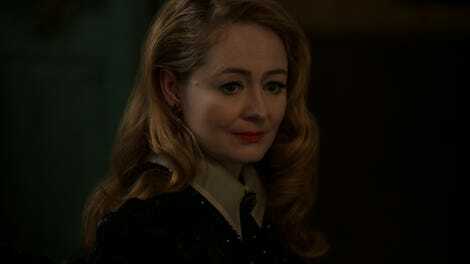 But even as she’s feeling some sense of triumph in her battle of wills with Satan, Sabrina’s efforts to reconnect with the mortals in her life are an unmitigated disaster. She panics while hooking up with Harvey, causes Theo to commit a horrendous crime, and is so disconnected from Roz, she doesn’t even go visit her to see how the fake chicken pox are going. 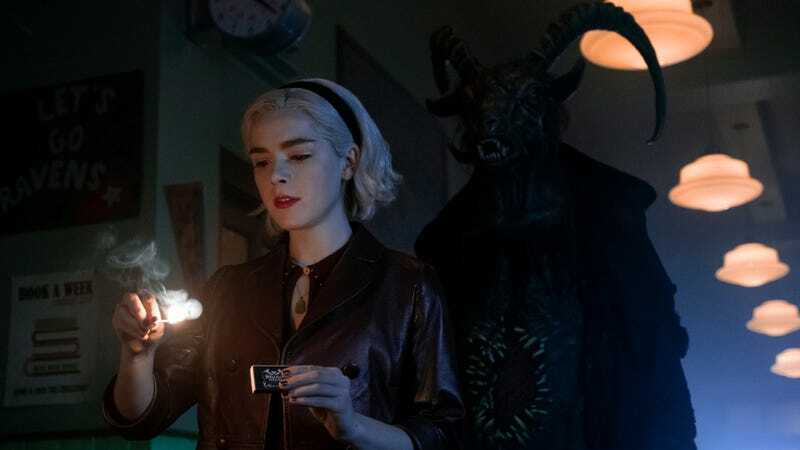 There’s a delicate balance for the show to strike between showing this disconnect between Sabrina’s new world and her old, and making sure that world stays connected to the ongoing plot of the show. The pendulum is always going to swing back and forth depending on what Sabrina is committing too, but right now, she’s getting further and further away from that world. It’s hard to say which of these two places she should actually belong in. At the Academy of Unseen Arts, Zelda threatens to kill a fellow teacher so she can establish her own dominance, and over at Baxter High, Theo is being tormented daily by brutish classmates while no one does anything. And just as Sabrina’s mortal friends are generally kind and decent, she also experiences kindness and decency from some of her Satanic connections, even if it’s mostly her family. It may be playing out on a stranger, more demonic stage, but the question of who you want to be in the world is pretty traditional stuff in the world of teen dramas. It just doesn’t usually involve anyone’s immortal soul. Not totally clear if it’s intended to sound this way, but Satan whining about how Sabrina signed his dang book is comically petulant. “No one has better diction than you.” “Well, that’s true,” said with the crispness of a Shakespearean actor treading the boards. Come on, these people have endless magical abilities and Sabrina still has to get teleported home so Hilda can give her the Heimlich? The show is leaning harder on the Nick romance, but he’s clearly completely untrustworthy, right? He’s like the nice, cute version of Satan, but still Satan. I’m sorry, Zelda’s nemesis is named Shirley…Jackson? Dorian, let’s maybe refrain from saying things like “The claw is inside you now” because it is gross. That was an impressively goofy looking fake cat they had Kiernan Shipka carting around. They really could have avoided the problem of her allergies by making Salem animatronic. Speaking of which, obviously the breaking point for Sabrina is when Satan threatens her cat. This is the most relatable this show has been for me, a decidedly not teen with no magic powers.